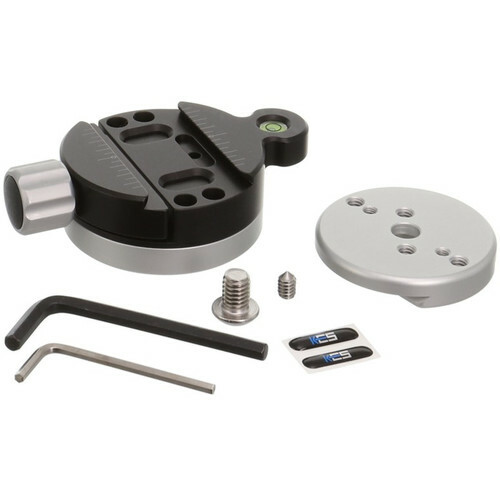 The black and satin silver anodized aluminum and steel TQR-2L Tripod Head Quick Disconnect System with Large Plate from Kirk Enterprises attaches to a tripod's spider via its 3/8"-16 mounting thread. This clamp provides a quick release system that enables you to quickly switch out many types of tripod heads for different photographic applications. The large plate is designed to fit tripod heads with an approximate base diameter of 2.25" or over. A laser-engraved scale on top of the clamp allows accurate positioning of the plate, which is then secured into place by turning the screw locking knob on the clamp. Set screws are included to secure the clamp to the tripod and the plate to the head and to prevent them from moving while mounted together. In addition, a bubble level is located on the side of the clamp to level out your horizon. Box Dimensions (LxWxH) 6.7 x 5.4 x 4.6"
TQR-2L Tripod Head Quick Disconnect System with Large Plate is rated 5.0 out of 5 by 2. Rated 5 out of 5 by Michael from Quality This is a very useful and well-thought out addition if you use a variety of heads on your tripod, e.g. ball head, geared head, gimbal head. Quicker than screwing and unscrewing heads and I suspect more secure because both the clamp and plate use anti-rotation set screws. This kit can be used to mount one tripod head to one set of legs. Additional plates (which come in large or small sizes) are available for additional heads for reasonable cost. I am aware that Arca-Swiss has their own quick link system for this purpose, but it costs more and is very difficult to find in the U.S. Note that this system does add height (~1.5 inches) and weight (9.4 oz, including clamp, plate, and all of the bolts) to your setup, so this is not something Ill be using with my light and compact travel tripod. I am using it on my heavy-duty FLM Berlin 38.4 tripod, and the additional stack height and weight are hardly noticeable. Rated 5 out of 5 by James from HEAVY DUTY - STURDY - SMOOTH Exponentially increases the tripod/ head combinations. Excellent addition to tripod/head equipment, almost a must have.